The plates have the usual UberChic Beauty size, and so do the images. And yes, they have the protective back and blue foil too, I'm sure that didn't come as a surprise! I like the size of the UCB images, when my nails are a bit shorter I can even stamp them sideways as well, offering even more options. 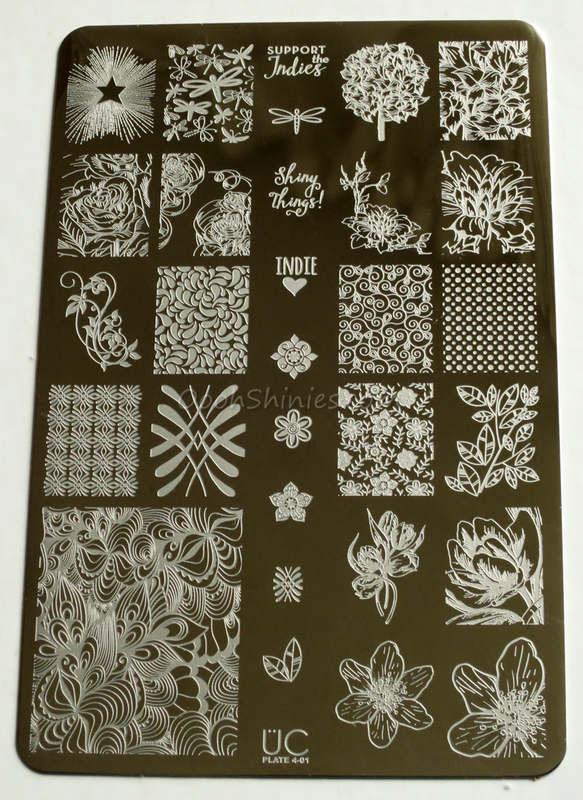 I recently updated my stamping plate size comparison, you can see how big these images are on this blogpage. 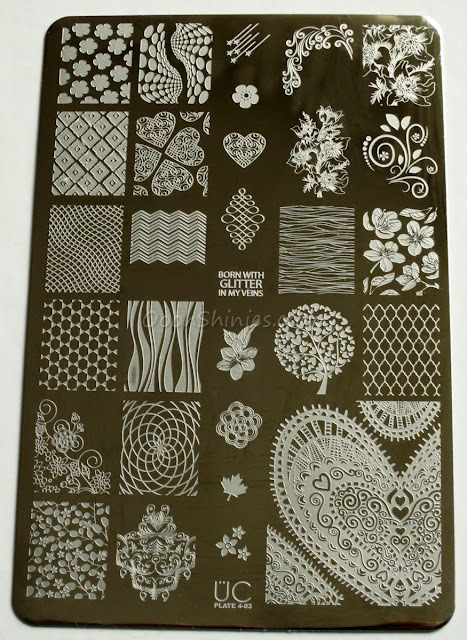 Here are the plates in the 4th collection, all plates are clickable for an enlargement! These plates really have that UberChic feel to them, don't you agree? I'll tell you straight away, it's yet another lovely set by UCB if you ask me! What I like a lot is that several images can be combined beautifully, because they're based on the same design, as the bottom right images show well. Or the loose flowers in the middle, that match the full nail image in the middle right. 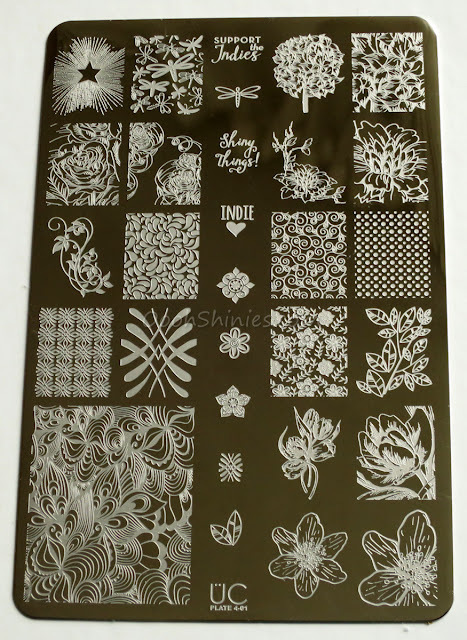 And that full nail image left of 'Indie ♥' reminds me a lot of an image of UCB plate UC 1-03 (the image on the middle of the right row), I think they'll match well to get a design stamped on normal and in the opposite way! The 2nd plate offers more of that typical UCB mix, floral, swirly, some really fine lined flowers, some geometric designs... That rose near the middle almost looks fiery! The image above that is the one that I used for today's nails, love it! If you looked closely and are wondering, the bottom left image in the corner has a little bit blue foil residue on it, nothing a little remover won't fix! I just noticed it later on :) And speaking of that image, I think those thick lines can create a nice balance between the stamping and a 'heavier' base, like a glitter or holo (instead of a more neutral, calm creme). 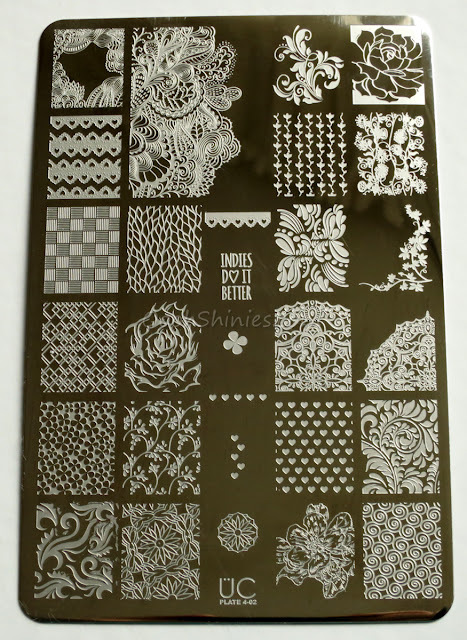 With such thicker images it's easier to not have the base overpower the stamping. 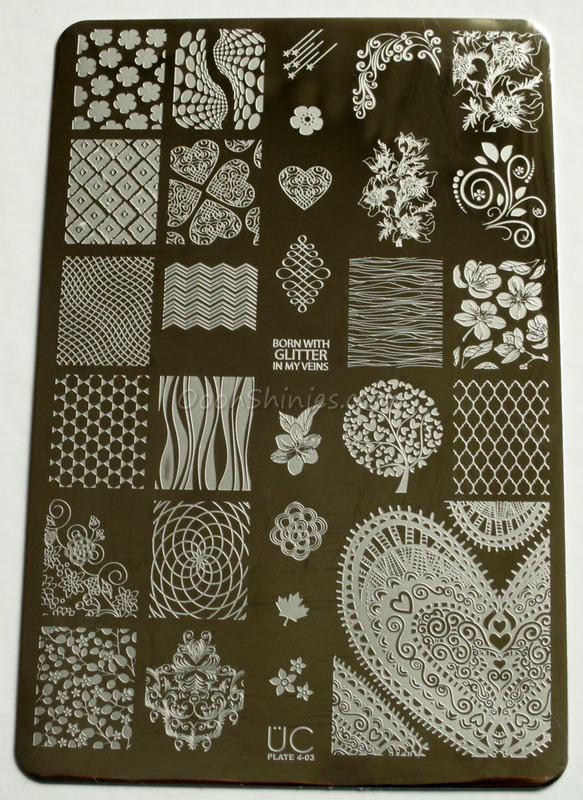 The last plate of this collection has a lot of designs that straight away jumped out to me, from the fine lines and the wider, more swirly lines (both around the middle), to the flowers with matching small flowers, and of course the wobbly net design and the one below those thicker lines (2nd row from the left, 2nd from the bottom). Such images like the last one can be tricky to get even on all nails, and I can be way too much of a perfectionist for such things. But with the reversed stamping, it's so much easier! These nails were done with that same technique, I applied a thin layer of top coat to the Uber Mat, stamped the design in black and took a bunch of holos from the good old OMG collection, and colored the design with a pointy dotting tool. So easy, yet with a lot of effect! The grey nails were done with a matte polish, but it didn't dry as matte as I'd like, so I added some extra matte top coat. Catrice Pebble Beach with Dance Legend Top Satin, accentnails of A England Camelot with Konad Black and UberChic Beauty plate UC4-02, with China Glaze LOL, DV8, BFF, QT, IDK and TTYL.